The last decade has witnessed rapid progress in our under- standing of the mechanisms of protein export and secretion in both prokaryotic and eukaryotic cells. Studies of protein secretion across the membranes of the rough endoplasmic reticulum have led to the formulation of the now-classic signal hypothesis, which has stimulated many discussions and new ideas, and the identification of the signal recogni- tion particle as an organelle in the initiation of the export process. However, more recent work pertaining to intrage- nic information related to targeting specific proteins for either secretion or membrane localization, the energetics of protein secretion, the timing of synthesis versus the initia- tion of export, structural requirements for the processing of precursor proteins, and the identification of the proces- sing enzymes (signal peptidases), has been the result of a combined biochemical and genetic approach to the study of protein localization in bacteria. While reviews on the biochemistry and genetics of pro- tein secretion have appeared frequently in recent years, this book attempts to summarize the current status and the future perspectives of this rapidly moving field in a single volume. 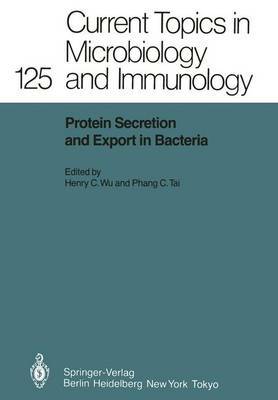 Topics covered in this book include the genetics of protein secretion in E. coli, biochemical analysis of pro- tein export in vitro, signal peptidases, excretion of colicins and hemolysin in E. coli, protein secretion in Bacillus, and protein secretion cloning vectors.